township, which is nestled below, remained in the shadows. The community of less than 5,000 residents is about 60 kilometers (37 miles) southwest of Bologna. 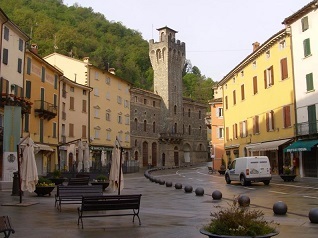 Since ancient times Porretta Terme has been famous for its thermal hot springs. For the past 28 years it has been famous for something else. As always, shop keepers scurried around their small businesses along the old narrow streets of the township. The faint, but distinct aroma of espresso and freshly baked Italian pastries was beginning to fill the air. However, on this morning there was something else brewing and something else in the air which was barely being disturbed by an ever so slight breeze. As the sun began to cast its gaze over the hills, it lit up the colorful old buildings that lined the streets of Porretta Terme. It was the calm before the storm. By the next day pilgrims from all over the world would start to descend on the town. They would speak in their native tongue, but in the same language nonetheless. They came in search of the salvation that can be achieved through the gospel of American southern soul music. For four nights, on the third weekend of July and for parts of the last four decades that wonderful music can be heard live in Porretta Terme, Italy, of all places. The Porretta Soul Festival has brought the biggest names in the southern soul music field to Parco Rufus Thomas on Via Otis Redding in the center of town. Booker T & the MGs, Sam Moore, Wilson Pickett, Issac Hayes, Mable John, The Bar-Kays, Rufus Thomas along with his daughter Carla Thomas, Mavis Staples, Andrew Love, Wayne Jackson and Floyd Newman have all played this festival. Half way around the world, in Biloxi, Mississippi, a man who has recorded with all of these musical giants, Joe Arnold, is packing and getting ready to head to Porretta Terme. With him is his passport and his calling card, alter ego, constant companion and lone “carry-on” item, his old Martin tenor sax. By noon the next day he would be touching down at Guglielmo Marconi Airport in Bologna, Italy. After eighteen hours of travel, which wasn't quite finished yet, he was back on the European mainland for the first time since the spring of 1967. It was then that Arnold, as part of the Markeys, along with fellow tenor sax man Andrew Love and trumpeter Wayne Jackson, along with Booker T & the M.G.s, played that band’s own tunes as well as backup singers Arthur Conley, Carla Thomas, Eddie Floyd, Sam & Dave along with the incomparable Otis Redding on the hugely successful and now legendary Stax/Volt European Tour. Just a few months after returning from Europe and his American breakout performance at the Monterey Pop Festival, the 26 year old Otis Redding lost his life in a small plane crash. That tour and the recordings from those musicians, and others of that era, are an irresistible elixir for anyone who hears that music. To this day, the sound of southern soul music cuts across the generations as well as the continents. It is the music that Italian, Graziano Uliani heard as a young man. Graziano started this festival on the 20th anniversary of the death of Otis Redding. 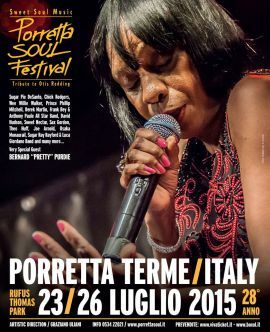 The Porretta Soul Festival remains a tribute to Redding and its founder remains the festival’s artistic director. It seems entirely appropriate that Joe Arnold’s first major public performance in several years would be here in Porretta Terme, Italy. Arnold has turned down gig after gig since he reemerged in the public eye in the summer of 2013 in the wake of an interview I conducted with the reclusive musician. 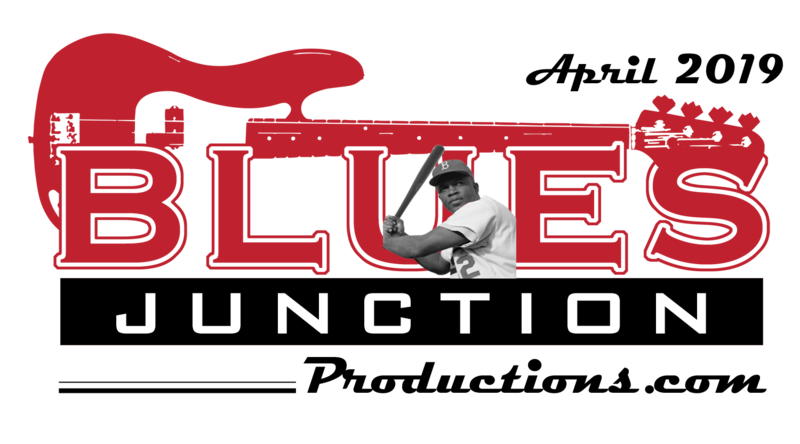 That piece which originally appeared in BLUES JUNCTION was also republished (with permission) on the Stax Museum’s official website in Memphis and the very comprehensive unofficial Stax website in Paris. I received numerous correspondences over the past two years from journalists, musicians, self appointed Stax-o-files and other fans of this music who like me, up until recently only really “knew” Arnold as just a name on the back of an old record jacket or on the front of a 45. After arriving in Italy it wasn’t long before Arnold was in a white Mercedes van. He was being whisked from the airport through the mostly two lane road that traversed the rugged mountain terrain of the region to the Hevitta Hotel in the heart of the village and just down the street from the stage and amphitheatre built several years ago specifically for this event. Here in the summer of 2015, it wasn’t just musicians from Mississippi and the American south where this music was made for the first time, but players from all over the globe who now carry on these traditions playing at the Porretta Soul Festival. One such band is the Anthony Paule Band from Northern California. They served as the festival’s “house band.” They backed up a parade of special guests, including Joe Arnold. This seasoned band of pros have backed soul/blues singer Frank Bey as the Bey Paule Band on three albums over the past three years and were returning to the Porretta Soul Festival as part of a European tour. 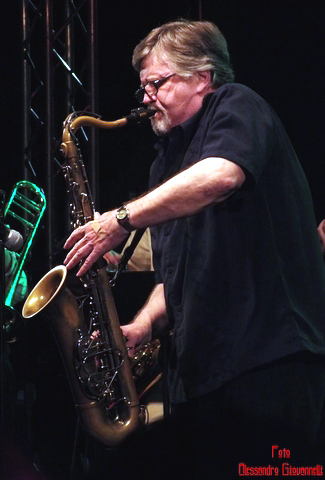 The band’s accomplished trombone player, Mike Rinta wrote the horn charts (55 to be exact) for the arrangements that would accompany the various artists. After resting up following a strenuous day of travel, which included stops in Atlanta and Amsterdam, Arnold was ready to go to work as he met up with the band for Wednesday afternoon’s rehearsal. Thursday evening the festival kicked off with mostly Italian and other bands from Europe. By Friday and Saturday it was the American headliners who took to the stage. They included vocalists Wee Willie Walker, Sugaray Rayford, Frank Bey and the irrepressible octogenarian Sugar Pie Desanto. Featured instrumentalists included the afore mentioned “Sax” Gordon Beadle and one of the most recorded and acclaimed drummers in the history of American music in general and soul music specifically, Bernard Purdy, as well as Joe Arnold. Joe was slotted for two numbers. The first being an instrumental version of a song written by Eddie Floyd and Steve Cropper entitled, 634-5789 (Soulville USA). The song was a hit for Wilson Pickett and it was that version on which Joe could be heard along with his fellow members of the legendary Stax house band. Then the band launched into the up-tempo instrumental hit by the Markeys entitled, Last Night. 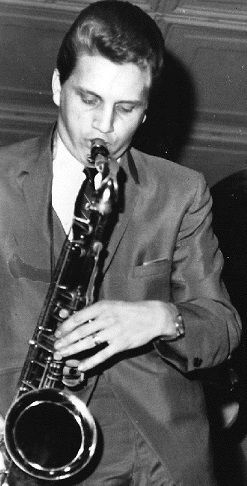 It was on this number that Joe Arnold took the iconic tenor sax solo night after night on the 1967 European tour. With the crowd going wild, the band, stage crew and festival producers decided to do another tune with Arnold front and center. He obliged and they played the tune entitled, Suds which was an early 60’s instrumental side cut by James Brown. Graziano Uliani then stepped up to center stage and addressed the huge throng. 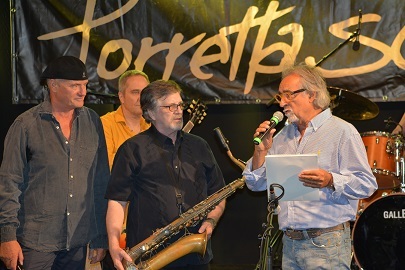 He presented Joe Arnold the 2015 Porretta Soul Festival’s lifetime achievement award called the “Sweet Soul Music Award.” Joe dedicated the award to his mother who passed away just two weeks earlier in Memphis at the age of 97. As the weekend wound down for Arnold and the festival, the musician took part in a long standing festival tradition. He, along with the other musicians from the festival, was treated to a meal at Ristorante La Pace. Gordon Beadle found Arnold a chair next to him at the end of one of the long tables that dominated the small eatery. While trying to eat his meal a parade of autograph seekers sought out Joe for his signature.